Sudden Cardiac Arrest (SCA) often strikes without warning. There's little time to react and no time to think, so it's important to have the HeartSine Samaritan AED 350P defibrillator on hand. The 350P is a clinically advanced, lightweight, compact, easy-to-use, and portable AED. Audio and visual prompts guide the user step by step through the rescue process. From trained first aiders to professional responders, the 350P is designed so that anyone, anywhere, anytime can save a life. 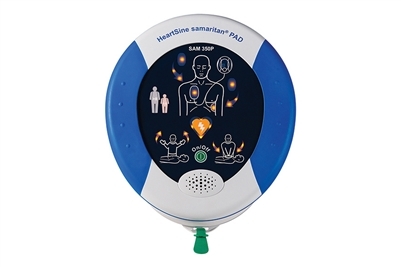 The HeartSine FULLY AUTOMATIC Samaritan PAD 360P is designed so that anyone, anywhere, anytime can save a life. Especially designed for use in public areas, the HeartSine Samaritan PAD 360P is a sophisticated fully automatic defibrillator for adult or pediatric use, inside a lightweight and easy-to-operate system. The SAM 360P is a fully automatic defibrillator designed to analyse heart rhythm and automatically deliver an electrical shock (if needed). Its advanced technology is balanced against the demands of real world use. Regardless of whether it is a layperson or a professional rescuer, ECE Guidelines place a greater emphasis on the importance of effective CPR in increasing survival rates after out-of-hospital cardiac arrest. 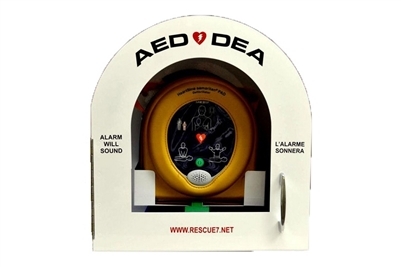 HeartSine Samaritan AED 500P defibrillator with CPR Advisor is the most innovative device available to support these guidelines, giving rescuers feedback on the effectiveness of their CPR efforts - in real time. 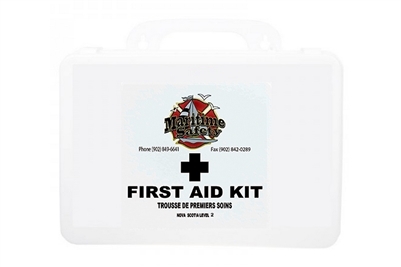 Maritime Safety carries a complete line of first aid kits and supplies. Our first aid kits come complete with all of the essential supplies required to meet all provincial regulations standards. Every workplace is required to have at least one person trained in First Aid and CPR. The contents of each kit are based on the number of employees in the workplace and the type of workplace. This kit was designed for workplaces with 1 employee. 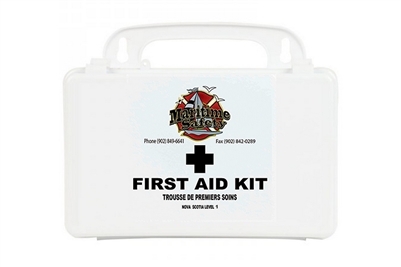 Maritime Safety carries a complete line of first aid kits and supplies. Our first aid kits come complete with all of the essential supplies required to meet all provincial regulations standards. Every workplace is required to have at least one person trained in First Aid and CPR. The contents of each kit are based on the number of employees in the workplace and the type of workplace. This kit was designed for workplaces with 2 - 19 employees. 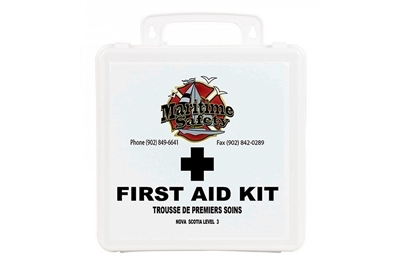 Maritime Safety carries a complete line of first aid kits and supplies. Our first aid kits come complete with all of the essential supplies required to meet all provincial regulations standards. Every workplace is required to have at least one person trained in First Aid and CPR. The contents of each kit are based on the number of employees in the workplace and the type of workplace. This kit was designed for workplaces with 20 - 49 employees. The HeartSine Samaritan AED Wall Bracket is a great alternative to a bulkier AED Wall Cabinet. The bracket takes up less room and can be used to grab the Samaritan AED quickly in case of a cardiac arrest event. The bracket holds the HeartSine Samaritan AED with its carrying case securely while the bracket is mounted on the wall. Wall mounting instructions included. The SAM PAD surface mounted/semi-recessed metal cabinet, with round top, is fully equipped with the audible alarm and has the capability to be connected to a security system cabinet. 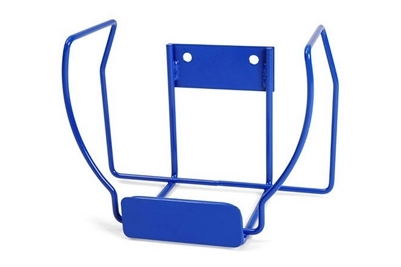 Its robust construction allows you to protect and position the SAM PAD in highly visible locations, and with its round-topped design it does not allow for any items such as pop cans and coffee cups to be placed on top of the cabinet. The HeartSine Samaritan AED cabinet is built to store your AED. 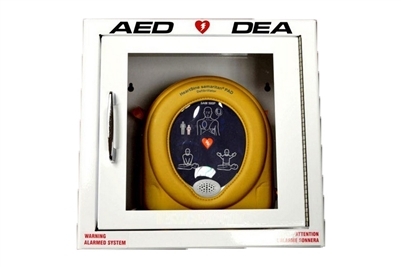 Robust cabinet construction protects your HeartSine Samaritan AED and provides for storage in high traffic locations. Each rescue station is equipped with an accessory alarm that can be activated when the door is opened. Our Ready-Heat Disposable Heated Blankets using our proprietary panel technology are used for slow continuous and consistent warming. They heat up gradually over a period of 15-30 minutes and after reaching peak temperature will remain warm for 8 hours. Ready-Heat 1 panel mini blankets are versatile and light weight. Weighing less than 10 oz. and with 8 inches of attached hook and loop they can easily adjust to fit all arms and legs, wrap an IV, be placed in most 1st aid kits or be strategically placed to heat many parts of the body. The 1-panel mini blankets are gradually warming devices reaching 104 deg F in 15-30 minutes and stay consistently warm for 8 hours. This blanket has been adopted by several International militaries for warming arms before administering an IV in the field. All Ready-Heat Blankets using panel technology come individually sealed in an oxygen free protective poly-bag. When the poly-bag is opened, the blanket's heating elements react with the oxygen in the atmosphere and generate heat. The heat generated will provide sufficient warmth and comfort to the user for up to 8 hours. All Ready-Heat Blankets have been approved for use on fixed wing and rotary aircraft by the US Military. Ready-Heat II is designed more specifically as a first responder blanket to treat shock and hypothermia. It warms to a minimum 100 degrees F/37.8 degrees C in 10 minutes and will maintain that minimum heat for 6 hours. The blanket has a foam core and is lightweight and comfortable. This comfortable warming blanket is also finding many other medical, EMS and other applications where warmth is required. Ready-Heat Disposable Heated Blankets use proprietary panel technology are used for slow continuous and consistent warming. They heat up gradually over a period of 15-30 minutes and after reaching peak temperature will remain warm for 8 hours. The Ready-Heat blankets are used to aid in the treatment of hypothermia, shock and patient trauma. Due to their high tensile strength both can be used as an evacuation litter (if needed) and can carry a person weighing up to 250 lbs. Both blankets are US Military protocol used in the transport of wounded soldiers and the Ready-Heat 4 panel (torso size) is carried by every US Army Medic. All Ready-Heat Blankets using panel technology come individually sealed in an oxygen free protective poly-bag. When the poly-bag is opened, the blanket's heating elements react with the oxygen in the atmosphere and generate heat. The heat generated will provide sufficient warmth and comfort to the user for up to 8 hours. All Ready-Heat Blankets have been approved for use on fixed wing and rotary aircraft by the US Military. Cool Blaze is a natural aloe base burn care product that is clear, odorless, effective and gentle. 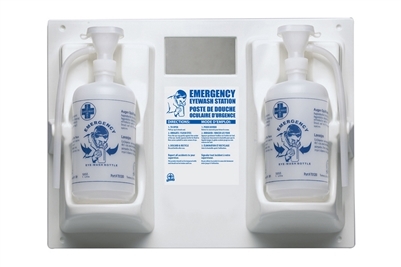 It is a must have item in every home, workplace and first aid kit. Topical Cooling Gel for minor burns, cuts, scrapes and abrasions. Emergency Dual Eyewash Station designed for quick decontamination of eyes or skin that has been exposed to harmful chemicals. 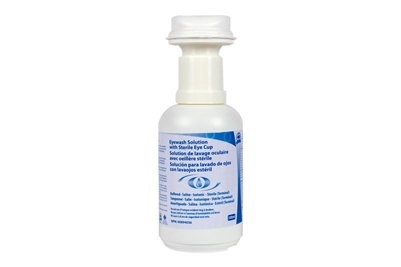 Eyewash Solution with Sterile Eye Cup is designed to keep your eyelid open ensuring a gentle and effective rinse. A sterile preservative free solution that flushes irritants, debris and removes foreign materials from the eyes.Soothes burning, stinging, irritated eyes.